There was no 'localism' nor territorial problems -- Nicaragua's surf champions regularly share waves with beginners and tourists. I glanced around the jungle lodge I had been sipping coffee in with my friend Dickie, noting the citizens of this obscure local: there was a social media expert from France typing away at her Macbook, wild-haired Australian surfers discussing the morning's waves, an American who used to be on a popular reality show and backpackers from all over the world, reading books and drinking tea. What exactly was this place? A secret we were all in on to be sure. This place was also like no other I'd ever enjoyed. Living in close-by San Juan del Sur, a charming seaside village on the Pacific coast of Nicaragua, I'd heard of Maderas Village all the time: it was a surf camp only twenty minutes away, an artists' colony, a Green hillside retreat overlooking the golden-waved Playa Maderas, or -- and this was my favorite -- it was a retirement community for young people. But what I found was a community of like-minded dynamic travelers and citizens of the world. To be honest, I originally had no desire to visit Maderas Village, but there was my friend DeWitt Foster III (he reminded me to put in the III), their charming social director and all-around guest concierge, inviting me up to the Village to hang out before I left Nicaragua. "My official job title is "Ambassador of Vibe," he told me in all seriousness. I promised him I would visit, mostly to get him off my back, and there I was on my last week in country. I stayed for two days but instantly regretted not coming earlier to live there for a couple of months. Upon arrival DeWitt showed me to my "room," a bamboo and wooden lodge with a high paloopa ceiling made with palm fronds, and sliding screen walls opening up to the jungle canopy. There was a purposeful, minimalist design to the lodge that I sensed wasn't an accident, and the only chairs were hanging down on thick ropes swinging from the ceiling. DeWitt strolled by with a whistle and took me on the grand tour. I found it necessary to poke fun at the fact that he was in cowboy boots and surfing board shorts, but soon the joke was on me as I slid all over the hillside paths in my flip flops as we explored the grounds; jungle lodges in various stages of construction, future plans for a pool, and pockets of banana trees they'd planted. I saw the infrastructure of generators that lit up the village (they soon will be tied into an electric grid that relies significantly on wind power), and indeed the electricity to each room was on only during the day, just enough to charge your laptop or keep the music playing in the great room. They had their own wells and water tanks and tossed everything organic in a compost pile. 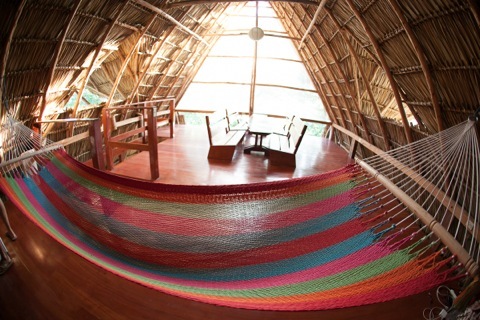 I learned the difference between a cabana, a cottage, and a casita, and how they used only naturally-fallen Nicaraguan timber and local artisans and craftsmen to build the village. DeWitt pointed out a great view of the ocean peeking through the trees, and explained that everything in the village was built to assimilate into the natural landscape, so we could see the beach from where we were, but if the surfers looked up the paloppa rooftops blended in and were invisible. Maderas Village has nineteen structures of varying sizes that can accommodate a lone person or a whole family, ranging from dormitories in the main house for only $20 a night to private rooms with a bathroom for $65 or renting out a whole lodge for a group. You can even partner up with the village and purchase your own cabana, which they will build for you and manage as a rental property for guests when you're not in town. Just leave your tropical clothing in your locked closet and all you have to bring is a carry-on bag when you fly down, less than three hours from Houston or Miami to Managua, an easy two-hour drive away from Playa Maderas. Folks are welcome for a single night or months, as long as they wish, and more than one guest has come on a whim and ended up living there. I could see how that would be tempting - when I saw those wooden writing tables, those colorful hammocks, everything light and airy, when I felt that warm breeze with a faint smell of the ocean below us, I envisioned setting up shop and writing the next great novel there (or just taking a killer nap in the hammock). Indeed, they are trying to foster an artists' community and encourage guests to paint, write, meditate, play music, or invigorate their creative juices. "It's a place for friends to live and think and create," Dickie simplified it. But this isn't your Aunt Irma's crunchy Kibbutz - Maderas Village has played host to corporate think tanks and executive teams who needed to sequester themselves and solve big time problems. Even the owners/partners in the project are ex-corporate heavy weights, financiers, real estate developers, attorneys, and businesspeople from all over the world who chose to eschew the profit-above-all-else mentality. They even have a partner nicknamed "Black Jesus," a highly-evolved cat from Philly who used to have a corner office at a big bank but now serves as the village's Wellness Director. We rounded up our tour and went to hang out in the open-aired great room of the main house where guests congregate and share all of their meals family style. The adjacent kitchen served fantastic, simple dishes and festive Pescatarian dinners. But that night it was Monday, Pizza Night, so the whole lot of us packed into a cramped shuttle and navigated the jungle roads until we reached Sergio's ranch house, an Italian gentlemen with a handlebar mustache and a passion for rock who owns a little pizza restaurant in San Juan del Sur, who once a week makes oven-baked fresh pies for his house guests. After a night of listening to howler monkeys traipse through the jungle I woke to dazzling sunlight and fresh café. I went along with some eager surfers who walked down a steep dirt road to Playa Maderas. I'm not a surfer but I can appreciate a great beach, complete with a rustic shack where locals sold cold Tona beer, orange Fantas, and amazing fish tacos while blaring reggae music. By midday the shuttles had arrived from San Juan and the beach was crowded with young backpackers and surfers. There they were, all sitting on their boards in the lineup until sunset, waiting for the next set to come in and their turn to ride the waves. I'm told it's safe on the beach and the locals get along great with the tourists. 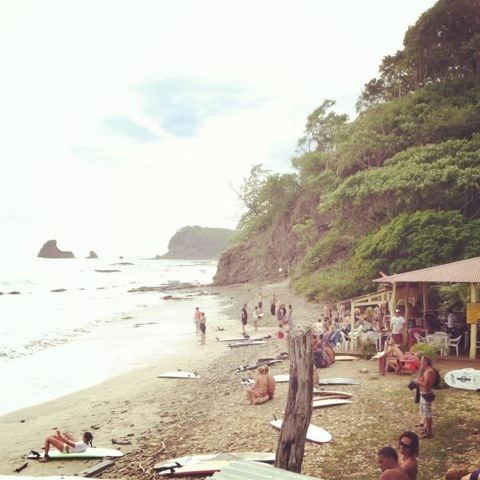 There was no "localism" and there didn't seem to be territorial problems -- Nicaragua's surf champions regularly share waves with beginners and tourists, and only smile and give them some pointers when someone unknowingly steals their wave. Once the sky went from pink to orange to dark purple they all grabbed their boards and we headed back up the hill, stopping only for a freshwater shower and a rum and gingerale at a jungle bar that had pictures of Martin Luther King Jr., Bob Marley, and Che Guevara on the wall while playing Manu Chao's Clandestino, the song about secrets. 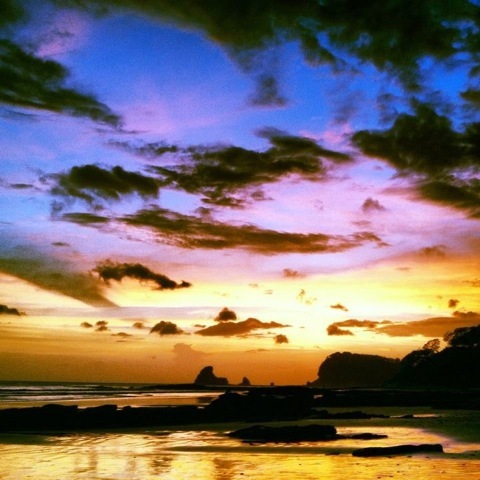 The next day it was time for me to head back to the "real" world of San Juan del Sur and pack up my apartment for my exit from Nicaragua. I said goodbye to all of my new friends - Dickie, DeWitt, Sabrina, Justin B, and Reggie from Denver, and the wonderful staff members, all locals and family themselves. We hugged it out and then did it all again ten minutes later when the truck hadn't arrived yet. I didn't want to go. I think all the writing in the world can't describe a place as well as that sentiment - I didn't want to leave. Maybe that's exactly what separates Maderas Village from the other ubiquitous ex-pat hotspots: it's not a place for people who can't make it in the real world, it's for those who want to make it a better world. Norm Schriever is a humorist, cultural mad scientist, and enemy of the comfort zone. He's currently living in Nicaragua and writing his second book, South of Normal.